We’d love your help. Let us know what’s wrong with this preview of The Rings of Tautee by Dean Wesley Smith. To ask other readers questions about The Rings of Tautee, please sign up. Fabulous titles hiding awful books! This book had a few problems and annoyances, but those were almost all minor. It wasn't the greatest writing ever, but for an ST novel it was actually pretty good. That Bogle character was useless and annoying. The only other major annoyance besides him that I can think of was the philosophical debate over whether or not to violate the Prime Directive or not (and whether their actions would actually be violating it or not) that happened in one chapter...was then rehashed in the very next chapter. This book had a few problems and annoyances, but those were almost all minor. It wasn't the greatest writing ever, but for an ST novel it was actually pretty good. That Bogle character was useless and annoying. The only other major annoyance besides him that I can think of was the philosophical debate over whether or not to violate the Prime Directive or not (and whether their actions would actually be violating it or not) that happened in one chapter...was then rehashed in the very next chapter. They seemed to come to a decision and then they needed to talk it out all over again? I thought time was of the essence? Why couldn't they have just said, 'Okay, we're doing this' and dealt with the consequences and explanations later? Not to mention the fact that the Federation or Starfleet or whoever made the Prime Directive up (in the fictional world, I don't mean the real life writer) was pretty stupid for intentionally making a law that can and does *spoiler! * condemn people to death. That doesn't seem very civilized to me. i loved this book i like star trek stories where the prime directive is involved because the crew cant exactly skirt the issue of it and this book is brilliant for that where kirk is ordered to save this race of people but the prime directive limits what he can do also goodreads have got the length of pages wrong its 242 pages not 256. also the prime directive is one of these plot devices where it says look you can do this but you can't do that. 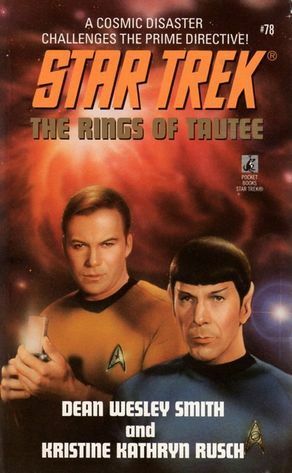 “The Rings of Tautee” is an original series Star Trek novel written by Dean Wesley Smith and Kristine Kathryn Rusch. The story follows the crew of the USS Enterprise as it investigates a Solar System which appears to be disintegrating. Whilst the crew suspect this may be a new Klingon super weapon they are also focused on a pre-warp civilization which will soon be wiped out. The Prime Directive limits their ability to assist this alien race, but if they don’t do something then this species and p “The Rings of Tautee” is an original series Star Trek novel written by Dean Wesley Smith and Kristine Kathryn Rusch. The story follows the crew of the USS Enterprise as it investigates a Solar System which appears to be disintegrating. Whilst the crew suspect this may be a new Klingon super weapon they are also focused on a pre-warp civilization which will soon be wiped out. The Prime Directive limits their ability to assist this alien race, but if they don’t do something then this species and potentially the entire galaxy will be destroyed by an ever increasing wave of destruction. This is a reasonably interesting novel which does a good job in its characterisations of the various original series characters. Considering the authors involved, I am not surprised by this as they are experienced Trek writers so know the characters well. The plot itself is entertaining enough and there are a few engaging emotional moments included, mainly related to the Tauteeans themselves.. However, I have to admit there were a few times that I rolled my eyes in disbelief at the number of issues which kept coming along. My biggest issue though, was in regards to the way in which the novel interprets the Prime Directive. I have always hated the way in which Star Trek sometimes uses the Prime Directive as an excuse for not helping a doomed civilization which is how it has been depicted here. In my mind, the Prime Directive should be used to ensure the Federation does not influence the growth or development of a civilization. It shouldn’t be an excuse to stand back and allow an alien species to go extinct. As I said, Star Trek has used the Prime Directive in this way before but it always annoys me as it never feels right to me and I can’t believe that this really would be the aim. I enjoyed it. Quite a lot of tension. I was surprised they could milk so much suspense out of a fairly simple story but it worked nicely. The relationship between Spock and Kirk suggested that this was a fairly early story in the timeline. It wasn't as warm as it became later. At best, this book pays tribute to the glory days of TOS. At its worst, thats all it is. Slow, episodic, with little to no technology, no sense of wonder, and the classic interaction between the Holy Trinity of science fiction (Kirk, Spock and Bones) barely gets a mention. And the book is way too short, the plot is too simple, the solution too obvious. The racist undertones that Kirk holds against the Klingons are ugly (mind you, they have them against Kirk too) but they are put aside too quickl At best, this book pays tribute to the glory days of TOS. At its worst, thats all it is. Slow, episodic, with little to no technology, no sense of wonder, and the classic interaction between the Holy Trinity of science fiction (Kirk, Spock and Bones) barely gets a mention. And the book is way too short, the plot is too simple, the solution too obvious. The racist undertones that Kirk holds against the Klingons are ugly (mind you, they have them against Kirk too) but they are put aside too quickly and easily and even at book's end one senses no real animosity between the two cultures which is odd to say the least. It's not as deep & detailed an epic as it could have been, but it's a solid combination of action, scientific puzzle, and ethical dilemma. It's far from being the most classic Trek story, but it's almost textbook in its construction of what makes "Star Trek" tick. This review has been hidden because it contains spoilers. To view it, click here. Not bad overall. A pre-warp culture causes an accident that not only destroys their entire solar system, but threatens to expand through the galaxy. The Enterprise manages to get the Klingons into a temporary alliance to seal the damage and rescue the survivors. Weak point 1 - just how many people can a Constitution class ship hold?!!?!!? Weak point 2 - two critical 'breakdowns' within a few hours of each other is overkill. Good point 2 - excellent reaction Not bad overall. A pre-warp culture causes an accident that not only destroys their entire solar system, but threatens to expand through the galaxy. The Enterprise manages to get the Klingons into a temporary alliance to seal the damage and rescue the survivors. This was an above average Star Trek novel. It was the fast-paced and the characterizations were right on. A nice, quick read. Very enjoyable. Not the best Star Trek book I've read, but still very enjoyable! Decent plot, good characterization. Pretty much the best you can hope for. A bit of a throw back. The novel was first published in 1996 so the characters haven't been scrutinized as much as they are in subsequent books. Overall I enjoyed the plot, the dilemmas and the interactions between the Klingons and the Tauteens. I am glad I read it. Great story line with a twist to the typical trekian conflict between the federation and klingons. Also includes Kirk's obligatory debate over following the rules or bending them for a greater good. The Rings of Tautee is an interesting story. While not completely mind-blowing, it's an interesting tale that presages cooperation between the Klingons and Federation, and presents a fascinating problem that brings disparate people together to try and solve. I was disappointed in the application of the Prime Directive, but that's a larger problem in Star Trek at large, in my opinion. Several great moments make this novel a little more memorable than some. Full review: treklit.blogspot.com/2012/07 The Rings of Tautee is an interesting story. While not completely mind-blowing, it's an interesting tale that presages cooperation between the Klingons and Federation, and presents a fascinating problem that brings disparate people together to try and solve. I was disappointed in the application of the Prime Directive, but that's a larger problem in Star Trek at large, in my opinion. Several great moments make this novel a little more memorable than some. The plot is not all that unique, but the novel contains some truly great, subtle character material. Entertaining enough to keep my attention. Decent story with pretty good characters. Good way to kill a hot Saturday afternoon. Fun to be back with favourite characters. Dean Wesley Smith is the bestselling author of over ninety novels under many names and well over 100 published short stories. He has over eight million copies of his books in print and has books published in nine different countries. He has written many original novels in science fiction, fantasy, mystery, thriller, and romance as well as books for television, movies, games, and comics. He is also known for writing quality work very quickly and has written a large number of novels as a ghost writer or under house names. With Kristine Kathryn Rusch, he is the coauthor of The Tenth Planet trilogy and The 10th Kingdom. The following is a list of novels under the Dean Wesley Smith name, plus a number of pen names that are open knowledge. Many ghost and pen name books are not on this list because he is under contractual obligations not to disclose that he wrote them. Many of Dean’s original novels are also under hidden pen names for marketing reasons.